Samsung Gear 360 (reviewed here) is a fully spherical 4k 360 camera. It initially sold for $349 (and was even sold for $399 when it was first released in 2016) but new you can get it for $189.99! The Gear 360 can only connect to high-end Samsung phones (Note 5, S6 series, S7 series). But it’s possible to use it without a phone. You’ll also need to have a decent PC (no Mac version available) to be able to stitch the photos and videos using the included ActionDirector software. For more info on the Gear 360, check out my Samsung Gear 360 wiki and resource page here. 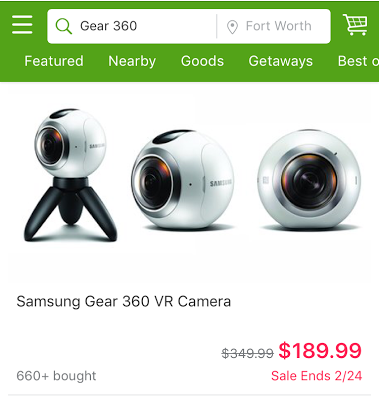 Here is the link: https://www.groupon.com/deals/gg-samsung-gear-360-vr-camera . And if you’ve never used Groupon before, signing up entitles you to a 25% discount (use coupon code WELCOME). Could this product protect your 360 camera lenses and possibly even fix scratches?